Four days after Hurricane Harvey made landfall on Texas' Gulf Coast, it is still raining. The now-tropical storm, which some climatologists are calling "the worst in US history," is now moving on through Louisiana. In response, the state is preparing for more floods and emergency evacuations. The National Weather Service issued a flash flood watch for all southeast parishes in the greater New Orleans and Baton Rouge areas Monday, as the outer rain bands from Harvey continue pouring eastward across south Louisiana. The flood watch is expected to last through Thursday, according to The Times-Picayune. A flash flood watch means weather conditions have escalated to the point where flooding is likely. Hurricane Harvey is seen in the Texas Gulf Coast, U.S., in this NOAA GOES satellite image on August 24, 2017. NOAA/Handout via Reuters THIS IMAGE HAS BEEN SUPPLIED BY A THIRD PARTY. IT IS DISTRIBUTED, EXACTLY AS RECEIVED BY REUTERS, AS A SERVICE TO CLIENTS. Tropical Storm Harvey is seen approaching the Texas Gulf Coast, U.S., in this NOAA GOES East satellite image taken at 10:07 ET (14:07 GMT) August 24, 2017. NOAA/Handout via Reuters THIS IMAGE HAS BEEN SUPPLIED BY A THIRD PARTY. IT IS DISTRIBUTED, EXACTLY AS RECEIVED BY REUTERS, AS A SERVICE TO CLIENTS. A collapsed overhead gantry lies across Interstate 37, blocking the highway due to damage caused by Hurricane Harvey in Corpus Christie, Texas, U.S., August 26, 2017. REUTERS/Mohammad Khursheed? Forecasters from The National Weather Service predict the New Orleans area could see between 5 and 10 more inches of rain this week. They also caution that rain could be heavier in some local areas and cause road floods in those spots. In the city of New Orleans, the weather service says rain could fall at two inches per hour. "Flash flooding is a very dangerous situation," the weather service wrote in its advisory. "You should monitor later forecasts and be prepared to take action should Flash Flood Warnings be issued." President Trump will survey the ongoing damage in Corpus Christi and Austin, Texas on Tuesday, after he said he believes Congress will act swiftly to provide funding to affected areas. Ten days before Harvey descended on Texas, Trump signed an executive order that revoked a set of Obama-era regulations that would have made federally funded infrastructure less vulnerable to flooding. As of Monday evening, two to three feet of rain have fallen on southeastern Texas, burying cities like Houston in water. 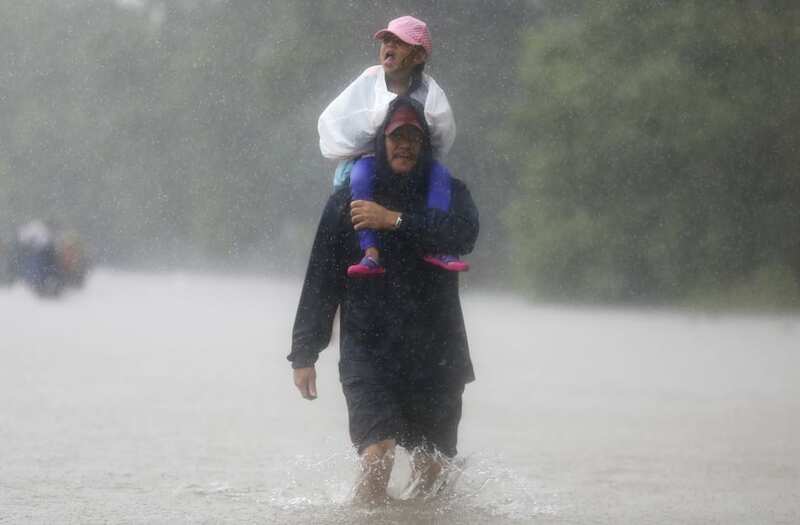 Houston is also bracing for another two feet of rain in the coming days. As of Monday, Harvey was classified as a tropical storm with maximum winds of 45 mph. Winds reached sustained speeds as high as 130 mph Friday. After landfall, officials ordered several Houston-area counties to evacuate due to fears of lingering flooding. In Louisiana, rescue teams near Lake Charles, 30 miles east of the Texas border, evacuated hundreds of victims as floodwaters deluged levees and river banks. Harvey could force more than 30,000 people in Texas and Louisiana from their homes by the time the storm ends, according to The Washington Post. August 23 through August 31 marks the 12th anniversary of Hurricane Katrina, which devastated New Orleans and several other southern cities near the Florida and Gulf Coast in 2005. "We just can't take any more," Calcasieu Parish Sheriff Tony Mancuso told The AP, urging residents to leave flood-threatened homes Monday. "Anything we get is going to be crucial at this point." Fill bathtubs, sinks, gallon jars, and plastic soda bottles so that you will have a supply of clean water. Sanitize sinks/tubs first by cleaning them using a solution of one cup of bleach to five gallons of water, then rinse and fill with clean water. Leave areas subject to flooding: low spots, canyons, washes, etc. Avoid driving through flooded areas and standing water.